You don’t just stumble upon perfection like the Home Ranch in Clark, Colo. Part of the reason this place is so magical is that it’s not really on the way to anywhere, and those who have found the Home Ranch have done so in search of a vacation so luxurious and comfortable that it was worth the trip, and many return year after year to a place that, indeed, feels like home. There are so many reasons vacationers make the Home Ranch their destination. It offers more than 18 miles of groomed snowshoe and cross-country ski trails on the property, and six more trails in the neighboring Routt National Forest. Expert guides who can get beginners started or accompany snow enthusiasts of any age or skill. Gourmet meals. The beauty of the Elk River Valley. Horseback riding. Orvis-endorsed fly fishing. The luxury and the people. The staff at the Home Ranch is expert at making a perfect Colorado mountain vacation so easy that the days start to run together and you forget how long you’ve been there. Guests aren’t exaggerating when they say eating is a highlight of staying at the Home Ranch. In fact, the only way to savor chef Clyde Nelson’s gourmet fare is to be a guest. Nelson, who has spent more than 20 years creating meals at the ranch, focuses on fresh, locally-sourced ingredients. For some, breakfast is the favorite meal. On this particular day, you could take your pick of Challah French toast, chicken apple sausage, apple-smoked bacon, oatmeal scones, home fries, fresh fruit, homemade granola and yogurt and strong coffee. Don’t worry, you’ll be hungry for lunch after hitting the trails. And as soon as you finish eating the cloud-like, warm center of your chocolate soufflé for dessert at lunch, you’ll find yourself wondering what’s next at dinner. That night, it was Chef de Cuisine Craig Singer’s creation: Perfectly roasted, organic free-range chicken garnished with prosciutto ribbons, surrounded by Romesco sauce and accompanied by polenta with Manchego cheese atop a creamy leek sauce. The next morning, you might take a trek with guide Mike Braal, who counts himself pretty lucky to spend his days snowshoeing and cross-country skiing with guests who enjoy his humor and stories. You can take it easy on the groomed trails around the ranch, or head for fresh, deep powder. 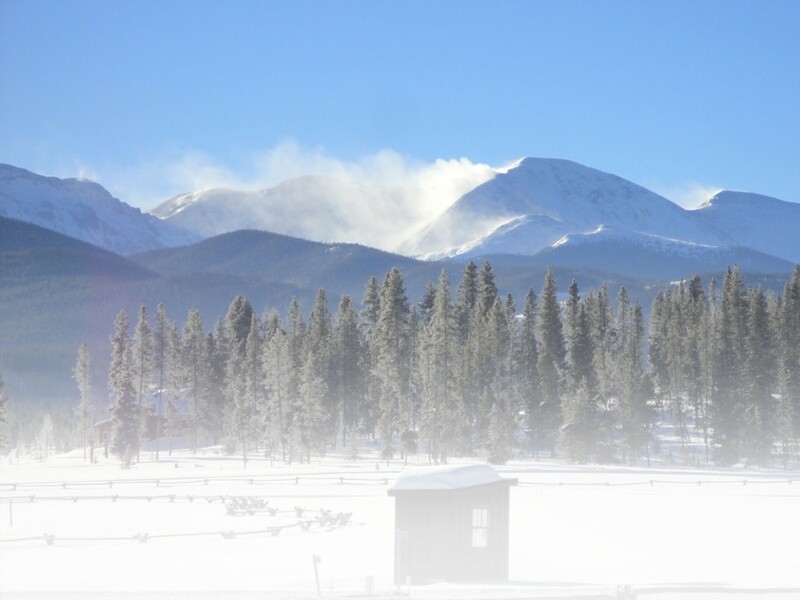 The trail to Old Pete’s Cabin is located within the 4,000 acres available to Home Ranch guests, bordered by National Forest on the east and west. The three-mile roundtrip journey started with breaking trail in deep snowdrifts. The ranch’s MSR Denali snowshoes helped us break trail through several inches of powder. Using the foliage poking up through the snow as a guide for the trail’s location, the group trudged up the hill with the focus only promised hot chocolate can provide. On the way back, we decide to make a row of snow angels next to the trail we blazed. We anticipated what delectable meal we would meet back at the ranch for lunch, which turned out to be our choice of roasted quail or panko-crusted cod with creamy tartar sauce. The experience at the Home Ranch is all about details and comfort. The way that all the employees know your name and where you’re from. The way that cookie jar in your cabin magically fills with homemade cookies every day. It’s about enjoying life and savoring every last bit of daylight you can go out and play on the trail. The quiet interrupted only by the soft pats of snowflakes falling on your coat and the crunch of snow under your shoes. Staying at the ranch is about relaxing before dinner, soaking in your private hot tub with a panoramic view of more than 100 horses frolicking in a field that looks like it’s inside a snowglobe with all the flakes swirling around. By the time you’re finished enjoying the company of other guests at a communal gourmet dinner with wine, the snow has probably finished filling up those snow angels you left on the trail. And guess what? You can get up in the morning and do it all again. The ranch is located 18 miles north of Steamboat Springs. Direct flights are available to the Yampa Valley Regional Airport (about 50 minutes from the ranch) from several cities: Denver, New York, Newark, Chicago, Minneapolis, Dallas, Houston, and Salt Lake City. Many visitors stay for a weekend or a whole week, depending on their flight schedules. The ranch offers complimentary airport pickup and drop off. Reservations for lodging are all-inclusive. You will receive one bill at the end of your stay. Prices include meals, transportation, entertainment, activities (snowshoeing, cross-country skiing, horseback riding, fly fishing, etc.) and equipment. Cabins start at $585 per night, double occupancy. Lodge rooms with private bathrooms start at $475 per night, double occupancy. Winter reservations require a two-night minimum stay. Summer vacations require a seven-day minimum stay (Sunday to Sunday). Visit www.homeranch.com for more information. The Whistler cabin sleeps up to five people, and features a private hot tub and wood stove. The group breaks trail to Old Pete’s Cabin, which is about 8,000 feet in elevation. The view from Old Pete’s Cabin includes a panorama of the Park Range through the aspen trees. Guide Mike Braal pets Timber, one of the ranch’s dogs, in front of the ski hut. The Home Ranch, located 18 miles north of Steamboat Springs, Colo., offers a luxury, all-inclusive vacation for winter sports enthusiasts. One of the ranch’s snowshoe trails borders the horse pasture, where more than 100 horses graze. This entry was posted in Destinations, Features, Homepage Featured by Erin McIntyre. Bookmark the permalink.